UPDATE April 25, 2017: Many of the critically wounded have succumbed to their wounds. The number of children who died in this terror attack is 110. 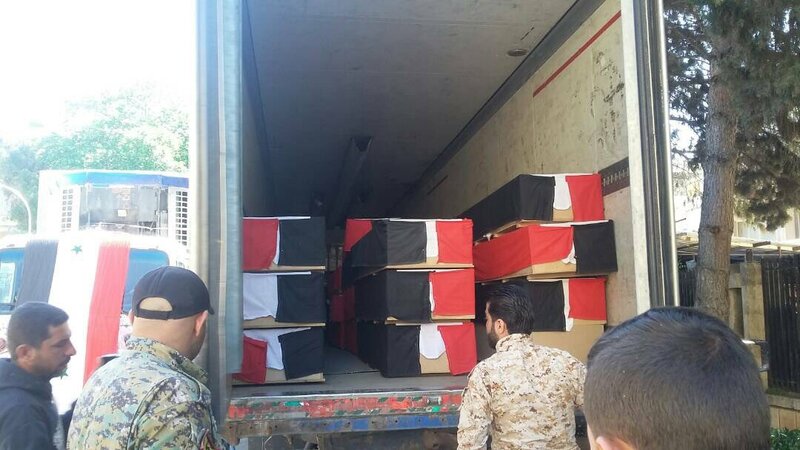 Photos: caskets have been prepared, covered with the Syrian flag, and trucks are transporting the bodies to Damascus. The bodies cannot be taken to their villages, because the terrorists still occupy those villages. 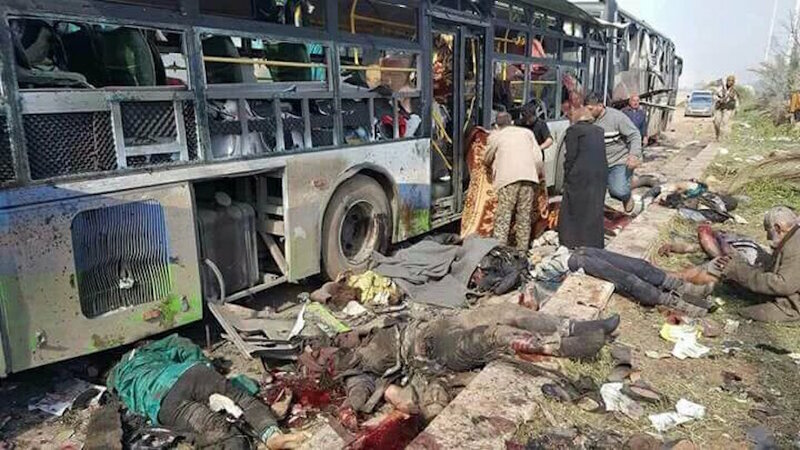 At least 70 are dead, 39 of which were children, in a terror attack in West Aleppo. Terrorists detonated car bombs where buses and ambulances were parked at the al-Rashideen area of Aleppo. The terrorists had placed the explosives in cars that were loaded with children’s food supplies meant for the evacuees. The buses were filled with residents from the towns of Foua and Kefraya who were evacuating because their towns are controlled by terrorists. There were also many evacuees sitting along the curbs along the long line of buses. The terrorists had deprived the residents of food, medicine and medical aid for more than a year. 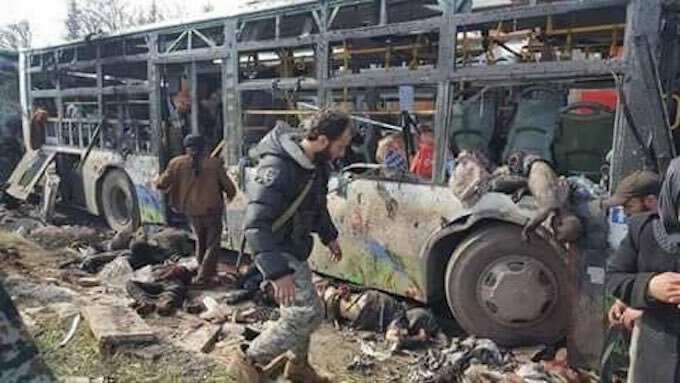 The bus stop where the bombs were placed was a transfer stop where residents from the Shi’a villages of Kefreya and Foua were to be transferred to areas of Aleppo city that are protected by the Syrian Armed Forces. The civilians in today's buses were at first stopped from leaving after terrorists fired several mortar shells at their buses last night. Turkey allows mercenary fighters to cross into Syria to join Jaish al-Fateh. Jabhat al-Nusra: This is al-Qaeda's main affiliate in Syria. Jabhat al-Nusra means “victory front”. Jabhat al-Nusra, or al-Nusra, stands for the Islamic Army’s front line of fighters for Islam, and of victory for Islam. Al-Nusra has been a long time supporter of various “opposition” groups including Jaish al-Islam, Ahrar al-Sham, and the Free Syrian Army (a Muslim Brotherhood group). They control enormous territory in Syria.